Tracking sales activities in a spreadsheet has become commonplace. Often referred to as a sales scorecard, this tool allows sales leaders to better manage the cascading chain of controllable activities that lead to sales. This is the first step towards a modern sales management system. As “Cracking the Sales Management Code” authors Jason Jordan and Michelle Vazzana explain, sales metrics quantify and track the day-to-day “doings” of your salespeople. “What are the sales reps doing? How are they doing it? Sales activities are the causes that lead to other effects,” the authors write. Salespeople often get lost in the business of their day-to-day role. But an inputs-drive-outputs approach allows you to create focus around the behaviors you know will lead to the outcomes you desire: closing more business. And that’s exactly what a sales scorecard gives you. After coming up with a hypothesis for your team’s KPIs, interview reps and managers. Get their feedback on what they think are the most important activities in the sales process. Afterward, you might want to modify your key selling activities. But you don’t have to. Feedback from reps and managers also helps determine what might be good secondary metrics and creates buy-in from the whole team. You probably feel like your salespeople love to complain that the quota you set for them is too high, but in certain cases, they might actually be right. A sales scorecard helps you evaluate performance against goals and the goals themselves. This means your rep needs to close 50 deals this year, at a rate of four deals a month. In essence, your rep would need to close a $20,000 deal every week of the year to achieve that quota. That’s a lot to ask of one person. To make this goal more achievable, you could split the quota between a team or cut the individual’s quota in half. At this rate, your rep (or team of reps) have to close at least two deals a month, or one deal every other week. Much more achievable than our original quota, right? From there, determine your average conversion rates between each step of your sales process: On average, how many proposals does it take to close one deal? How many discoveries does it take to send out a proposal? And how many opportunities do you usually source before one agrees to a discovery? Now you can reverse-engineer your sales process and determine how many of each activity it will actually take to achieve quota. For the sake of simplicity, we’ll assume a 25% conversion rate for each step. These goals are achievable, which shows that the quota your team contributes to is also achievable. In general, salespeople want to be successful. They crave real-time performance feedback that tells them how and where they can improve. A CRM dashboard or report won’t tell them this. But a sales scorecard can. Once you’ve defined and calculated your team’s sales activity metrics, have reps use the spreadsheet (free template below) to track them. The most efficient way to do this is in real time, right after reps complete an activity. Note that there are sales technologies out there, such as sales management systems, that automatically track activities within your CRM, calculate pacing to goal and alert reps and managers when performance falls out of line. Tracking performance against goals in real-time allows reps to see how they stand performance-wise (as well as what they need to do to get back on track or stay ahead of their goals). If a rep sees that they haven’t sourced enough opportunities this quarter, they can hit the phones and start qualifying leads. Another rep might notice that he has the right amount of discovery meetings, but not nearly enough proposals. That rep can then ask for some coaching on converting a discovery meeting into a proposal. That brings us to the final benefit: sales scorecards serve as a great foundation for weekly one-on-ones and coaching sessions. It allows sales leaders to quickly gauge how and what each rep is doing to reach quota. Sales leaders can also identify pain points and coach accordingly. 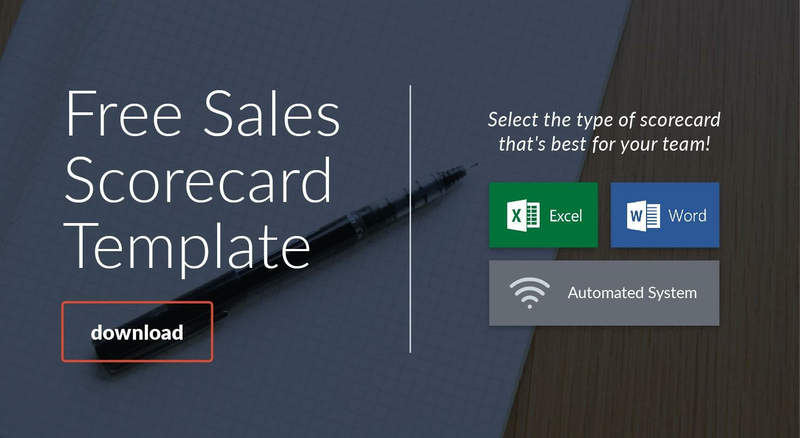 The sales scorecard may seem like a big deal, but the template itself is easy to get going. That’s why we created a totally free version for you (grab yours below)! The effects this spreadsheet will have on your sales team are a big deal, and you’ll start to notice them almost immediately. A sales scorecard allows sales leaders to manage the cascading chain of events that lead to sales. Here are 3 reasons why you need one for your team.